The Skin and It's Hazards | pr88 / GAMP Inc.
Our skin with its outer corneal layer (stratum corneum) over which lies a hydrolipid film, forms the natural barrier between our bodies and the environment. The corneal layer comprises several layers of dead skin cells that are constantly being replaced by the shedding of old cells and the growth of new cells from the deeper skin layers. 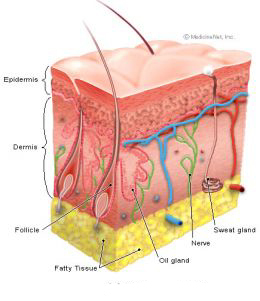 Fatty substances (lipids) surround the corneal cells (corneocytes) like mortar around the bricks in a wall. The top priority needs to be to retain the natural barrier function of the skin and to support its regeneration. 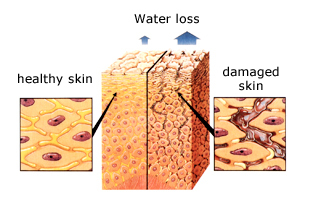 Dry skin may be an indication of serious skin damage. This is the point at which skin protection and skin care measures should, at the latest, be taken or improved. sweating and contact with the moisture inside tight-fitting protective gloves when worn for a long time. Even slight but constant stress that does not leave any visible damage even over longer periods, will have a negative effect on the skin at some point. Skin protection products can largely prevent contact with hazadous and skin damaging substances and when used regularly, reduce the risk of skin desease. They should be selected according to the specific workplace factors the skin will be exposed to. General purpose products are always a compromise. The selection of an appropiate product should be based on the type of substance to be removed. In order not to stress the skin unnecessarily, the mildest possible cleansing agent should be used. Improper cleansing is one of the main causes of skin diseases. Thinners and solvents should never be used for cleaning the skin. Skin should be cared for regularly both during and after work. Skin care agents protect against rough, dry and cracked hands and help to maintain the natural protective function of the skin thus reducing the likelihood of skin deseases. Cared-for skin not only looks better, it is also more resistant to day-to-day stress.